AFP photographer Kent Iberg was on the sidelines for Saturday’s ACC clash between UVa. and Clemson. Check out the day in pictures from Kent’s lens. Clemson tailback James Davis (28) tries to elude a pair of Virginia defenders. Davis ran 18 times for 65 yards. Clemson quarterback Cullen Harper efforts to get the Tigers out of the shadow of their own end zone. Harper was 18-for-28 passing for 121 yards. UVa. wideout Kevin Ogletree is on his way to an apparent 53-yard game-tying third-quarter touchdown, but the play was called back when Ogletree was flagged for a questionable pass-interference call. 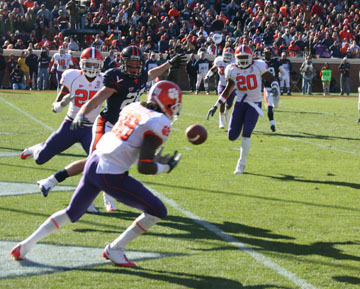 Clemson defensive back Crezdon Butler intercepts a fourth-quarter Marc Verica pass intended for wide receiver Jared Green. The family of Virginia linebacker Clint Sintim supports their guy on Senior Day.